• The watch is not waterproof. • The watch only supports NANO SIM card. • There will be a code for connecting to Bluetooth if you use iPhone. • The watch should be charged by the computer USB or charging base(5V/1A) via the Special Charging Dock. 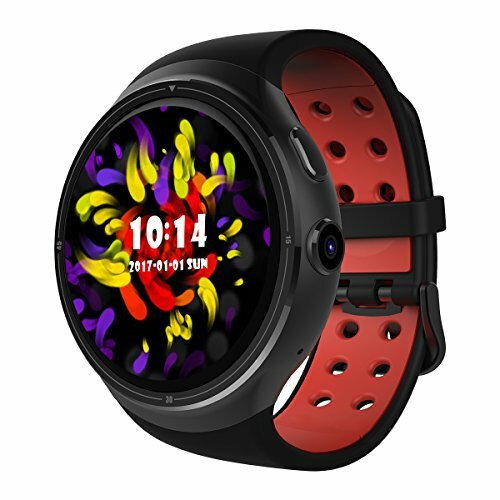 Q: If I do not insert SIM card but I connect the watch to my phone via Bluetooth, then can I make or receive a phone call? Q: Can I change the strap? Q: What's the app name of this watch? Q: How long can the battery work for? A: Standby time is about 72 hours, continuous talking time is about 3.5 hours after 2.5 hours full charged. Comes with optical heart rate monitoring function, is constructed with tough screen display. The watch records your every step, the calories energy consumption and the distance calculation accurately. After inserting the SIM card, you can use the watch to call and view the phonebook and make a call. You can view, edit and send the message or other notification reminder. After connecting the APP successfully, you can use the watch to control the camera and music player on your phone. Also you can use the Find Me function to find the watch or the mobile phone. Alarm, Stopwatch, Weather Viewing(real-time), Recording, Calendar, Clock, Browser, File Management, Input Method, etc. Compatibility: Phone has a Android 5.0/iOS 9.0 or above, support Bluetooth 4.0. Advanced Configuration: Built-in Android 5.1 OS, MTK6580 CPU, 1.0Ghz Quad Core Processor, RAM/ROM 1GB+16GB, 200w Pixels Camera, 1.39inch 400*400 Resolution Capacitive AMOLED Touch Screen. Support 22 Languages and has a multiple language user manual. Multi-function: Support NANO SIM Card, WLAN, 3G network, GPS, Microphone, Speaker, G-Sensor. You can download applications and voice assistant from the app store via Wi-Fi or GPRS after inserting a Nano Sim Card. Unique Exterior Design: Multiple different styles of dial interface can be selected. Also you can download from the Internet. The zinc alloy case and black silicone band makes it more comfortable for wearing. Adjusted strap length from 17.5cm to 24cm. If you have any questions about this product by Diggro, contact us by completing and submitting the form below. If you are looking for a specif part number, please include it with your message.